Character profiles from Coen brothers' movie No Country for Old Men. Anton Chigurh. Photo by Moisés Bello. Name: Anton Chigurh (Javier Bardem). Work Description: Professional hired killer. Age: Early forties. One. Anton Chigurh is an emotionally detached character. He is psychologically removed from other people and from his own self. There is no mention of him having a home, a personal life, or any close family and /or friends. He is annoyed by the question where is he from (which is the inquiry that sets him off in the scene at the Texaco Gas Station). Two. Chigurh embodies the idea of violence. He is more similar to death than to a character. In his singularity (he is always shown alone) he represents something final and gruesome. Three. Chigurh is akin to a hunter. He is calculative – without emotion he does what is needed in order to catch the prey. He does not consider or understand the feelings of other people – suggesting he might be a victim of a mild case of autism. There remains a little clumsy humanity in his character that’s there to keep him from being unbelievable. One. Chigurh contrasts with Sheriff Bell and the man who he is chasing – Llewellyn Moss who are both family men. He does not seem to have a private life and neither is he looking for any relationship with the other characters. Two. The only scene where we see Chigurh relate to other people in some way is in the chosen scene in the Texaco Gas Station – What business is that yours where I'm from... Friendo – he submits to the clerk with anger and waits for an answer. He then toys with the old man like a dog would toy with a farm animal – This coin has travelled for 22 years. And now it's here. And you have to call it – and he waits for the reaction on the face of the scared old man. This is the most revealing scene in the movie in terms of Chigurh’s character. One. Chigurh is familiar with medical equipment and drugs. He knows exactly what to steal from the pharmacy when he is shot in the leg by Moss, remaining calm and methodological in his behavior suggesting past experience in the medical field. Two. He operates a variety of weapons with skill such as shotguns, handguns, and a cattle gun but also demonstrates capacity for close combat (for example when strangling the deputy sheriff). He also drives a car and knows how to make it explode. One. 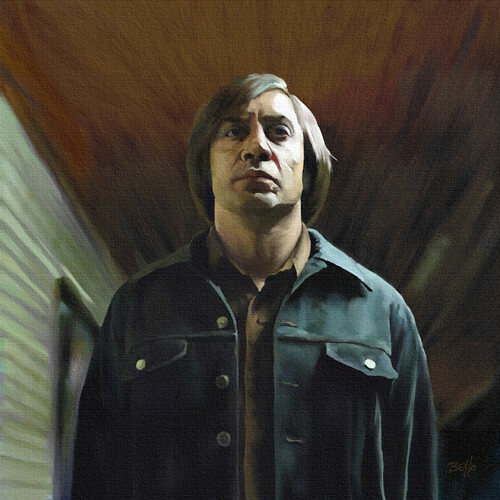 Chigurh is 1.83 meters tall with a strongly built frame but his lean physical features akin to an animal such as a Cheetah make him appear slightly predatory – which he is. Two. Chigurh has facial features that are strong and chiseled – a broad nose, heavy eyebrows, protruding cheekbones and a well defined chin in the long oval frame of his face. His sharp gonial angles and a robust yaw add to the masculinity. Three. Chigurh’s skin has a darkish complexion and the fact he speaks with a foreign accent this suggest he is not a local man – instead perhaps of Mexican ancestry. One. Chigurh is a man of stylish and he has a recognizable signature element – a bowl haircut draped across his high forehead. Chigurh’s hair is turning slightly grey and thisgood boy look contrasts with his intimidating character giving him a more twisted appearance. Two. Chigurh prefers to dress in dark denim clothes making him look like a bona-fide grim reaper. His signature wardrobe items include a pair of black jeans, a dark blue collared jacket, and a brown cotton shirt buttoned down to show off his strong neck. He is clean shaven. Three. Chigurh’s footwear is well chosen and taken care of. He wears shoes with a high heel (not a common choice highlighting his interest in the matter) and white socks that he changes regularly when they get bloody after a kill. Chigurh has a very commanding body language – when he enters he immediately fills the room; just by being there he controls the environment and it seems even inanimate objects have to obey him. Chigurh speaks with a tone of voice that is deep and musical but with a low masculine pitch and a coarse accent. He speaks with a slow rhythm suggesting there is no hurry and what happens will happen anyway. Chigurh is driven by his values and preconceptions about the world. This is a character that holds true to his principles and they lead his decision in the film. One . Chigurh holds conservative views on male and female roles – he smirks with contempt at the idea of a man marrying into a household in the Texaco scene. His knowledge of the history of coins suggests he has had a good education, perhaps in one of the schools that separate males and females justifying his dispositions in these matters. Two. Chigurh has a strong set of principles regarding fairness and commitment to his promises – however twisted they may be – when has promised himself to kill someone he will do it (this part of his personality is revealed in one of the final scenes when he waits for Carla Jean – Moss’s wife – and kills her). Three. Chigurh is concerned with the way people live their lives and lets faith pass judgment on them based on this history – as he says to the Clerk: You've been putting it up your whole life and you just don't know it. Chigurh represents the Texas of the past times – a lawless country where either you adapt or you die – and if you have lived your life in a way that deserves a death faith will not preserve you. Chigurh is an iconic character whose image is determined to an extent by his relationship to the objects he uses or carries around with him. One. There is an aesthetic to the way Chigurh kills. The first thing we know about him is that he carries an oxygen tank with a hose. Later this is revealed to be a cattle gun used to decapacitate livestock. For Chigurh this is the most humane way to end someone’s life as cleanly as possible – he is meticulous in trying not to get his hand dirty or have any contact with blood. Two. In addition Chigurh carries a shotgun with a silencer, and a handgun that both follow the same principle of making a clean kill without disturbing sounds. Three. Chigurh carries a pocketful of coins. He is familiar with their history and knows their dates. He uses them to measure the fate of the people who are on the ledge – he is unsure if they should be killed or do they still deserve to live. He is the one executing the rule but he is not then one making it – these are higher powers. Destiny happens whether the victims like it or not. There is remarkable lack of interior conflict because what happens has already been decided and what will come too. It's only a matter of time. He is here only as a spokesman. It is very unnerving to see his slow answers as if what he is saying came from somewhere else - god, destiny. What is happening is bigger than you and I. As if talking to a religious person. Despite an accident in the end the film he continues relentlessly. There is no stopping him. Chigurh’s external conflicts are short lived and violent suggesting he does not enjoy seeing extended suffering. The use of a cattle gun supports this hypothesis as that weapon is used to kill animals with the least amount of pain. His conflicts are with people who do not want follow his rules of game play (the coin toss) which he externalizes by attacking and killing those who annoy him (for example Carla Jean). His personality conflicts begin with being cold and austere to himself; Chigurh does not display any internal suffering or pain or empathy. But he is still charming and likeably to the viewer – which is one of the mysteries of his character. Chigurh is hired to retrieve the drug money and kill Moss. However, this is not his motivation (he kills the people who hired him) – his motivation is justice and in his principles. He holds high morals about a certain way life should be and derives it from a higher power.